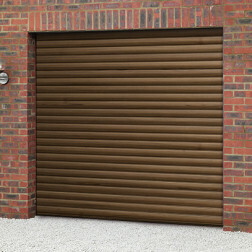 If you’re looking for a way to save space in your garage, roller garage doors are an excellent option. With roller garage doors, there are no protrusions with tracking in roof space, meaning you’ll have maximum drive through space. 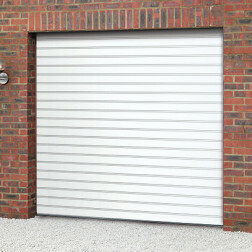 Roller shutter garage doors are usually fitted behind the brickwork and don’t require a separate frame, although some insulated doors can be fitted within the opening (please note, headroom may be lost – please call to discuss this option). 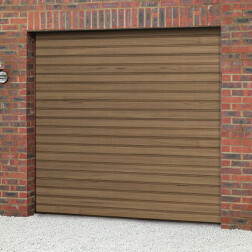 Roller garage doors rise vertically and up into a roll above the lintel on the inside of the garage roof, leaving you with plenty of garage floor and wall space. All of our roller garage doors are made to measure so you’ll need to provide us with your exact brick to brick and floor to lintel opening sizes in millimetres to order the correct size door. You’ll require about 90mm on each side of the back of the aperture for the tracking to sit. All insulated door’s come automated as standard. 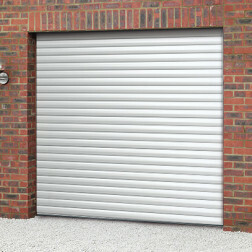 For the non-insulated Steeline roller door’s you can add an operator to your order. You can fit this to either side of the roll but it will require a minimum of 150mm of space next to where the roll will sit on the side where you would like to fit the motor. For more information about our roller garage doors, you can visit the Spec page and our Technical Help section or call us on 0800 404 8011.